It never occurred to me that elephants would feature in a project about village churches, but they keep turning up. 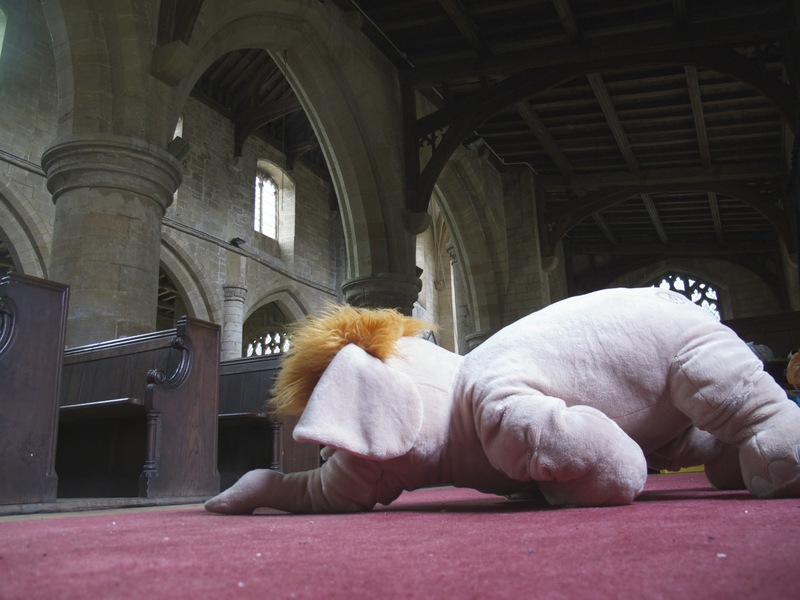 This one lies on a carpet in the children’s area of Moulton Church, waiting for some small person to sit on him. There seems nothing incongruous about him in this graceful medieval building: both serve to express the human need for love. Some of the older residents of Moulton remember how severe church services once were: it was forbidden even to turn around in the pew. Times have changed. Mary Brice spoke to me about the festival of animals she organised in the church a couple of years ago, which included a service to bless and give thanks for local people’s pets: dogs, birds, cats and other creatures took place with their owners, while the then vicar’s cockerel paced the ancient floor. I think the medieval people who made Moulton would have felt entirely comfortable with the presence of animals, living and stuffed, in their church. People lived more closely with animals then than most of us do today, even taking them to court in certain circumstances.